A compact, portable introduction to the history, concepts, and thinking behind philosophy laid out in DK's signature visual style--the ultimate guide to understanding philosophy on the go. Take Descartes along on your day trip! This compact guide explores the history and concepts of philosophy, and demystifies its often-daunting subject matter. Explore feminism, rationalism, idealism, existentialism, and other influential movements in the world of philosophy. 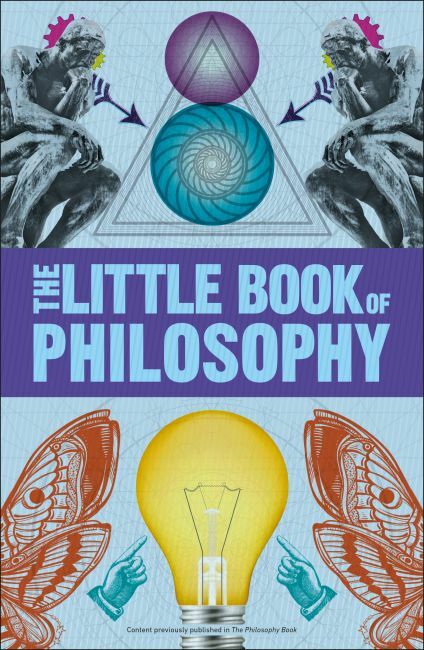 The Little Philosophy Book unpacks the writings and ideas of more than 100 of history's biggest thinkers, including René Descartes, Mary Wollstonecraft, John Locke, and Thomas Hobbes, taking you on a journey from Ancient Greece to the modern day. From Socrates to Confucius to Julia Kristeva, The Little Philosophy Book breaks down difficult concepts using innovating graphics that pop off the page alongside creative typography. Cutting through the haze of academia and untangling complicated theories to show how our social, political, and ethical ideas are formed, The Little Philosophy Book contextualizes the information around time periods, innovative thinkers, method, and philosophical approach. With graphics and clear writing, The Little Philosophy Book is a compact but comprehensive introduction to a complicated and fascinating subject, and the perfect way to expand your mind as you head out on vacation.